Guitar cables, speaker cables and interconnects are often overlooked in our quest for great tone so what’s on the wire? If you think the guitar world is full of voodoo, snake oil and pseudo-science, you should check out the preoccupation with cables in the even wackier world of hi-fi audio, where the likes of skin effect, oxygen-free copper and dielectric biasing flow freely. We guitarists are also pretty dependent on cables in our rigs, and some of the marketing blurb can get pretty ‘out there’, too. Of course, cables do make a difference to our tone – but for reasons that can actually be measured and explained without the need to resort to too much leftfield science. As guitarists, we are primarily concerned with speaker and instrument cables. They are different and should not be used interchangeably. Take a look inside an open back combo and you will probably see two wires of identical diameter connected to the speaker terminals. They may be loose or twisted together, but they are basically separate. Speaker cables for connecting heads to cabs have a jack plug at each end and generally look like regular guitar cables – but they’re not. An outer layer of insulation contains the two wires but it merely protects the wires and keeps everything looking neat. Instrument cable is also known as coaxial cable. If you cut it in cross section, you will see a centre wire with an outer layer of wire braid separated by insulating material. The inner wire is soldered to the tip connector of a jack plug and the outer layer is connected to the sleeve tag. The outer layer shields the inner wire from radio frequencies, fluorescent light interference and mains hum. After all, any noise picked up by the cable will go straight to the amplifier along with the guitar signal. 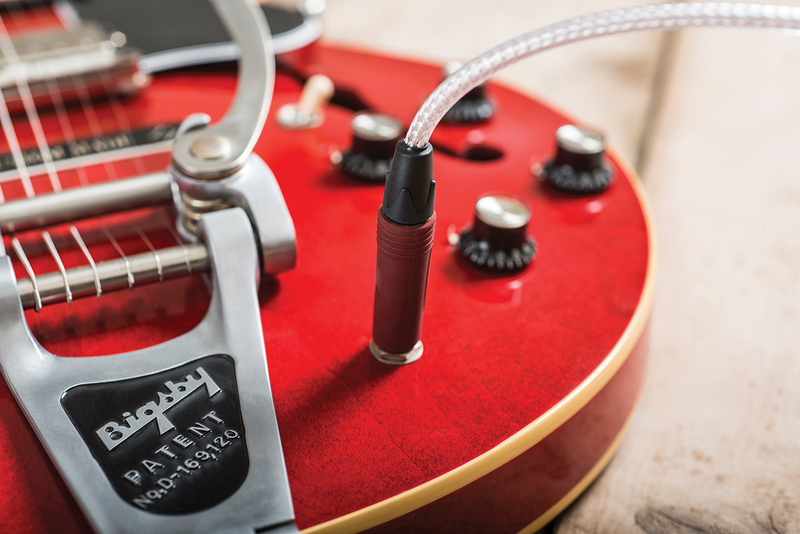 If you try to use speaker cable between your guitar and amp, things are likely to get noisy – and not in a good way. The consequences of using instrument cable to connect an amp to a speaker are potentially far worse. Since pickup signals are so tiny, there is no requirement for instrument cable to have high power handling, so the wires are much narrower. If the power generated by the amp is too great for the cable, it may get hot, which increases cable resistance and decreases the power reaching the speaker. The amp will ‘see’ the cable as added impedance, so it may end up overheating and if the insulation inside the cable melts, the wires may short out resulting in transformer damage. For speaker wiring, there are two key priorities – low resistance and high power handling. You can make your own speaker cables by soldering mono jack plugs onto regular mains cable and they’ll sound fine. Cable resistance is proportional to length and diameter, so by using thick wire and keeping its length short, low resistance is maintained and the cable will handle the amp’s power without overheating. Electric guitar amps and speakers are not high-fidelity devices so the typical audiophile obsessions with imaging and frequencies beyond the range of human hearing do not apply. Classic tweed amps had cloth covered speaker wire and vintage Vox combos were hooked up with something resembling bell wire, yet most agree they sound fantastic. If someone does try to convince you that exotic speaker wire will improve your tone, it’s probably because they’re probably trying to sell you some. In contrast, instrument cable can have a profound effect on your tone – but only if you have conventional passive pickups. Low-impedance active pickups are pretty much immune to cable quality and if that’s what you use, it’s safe to stop reading right here. A theoretical ideal for an instrument cable might stipulate zero loss of signal between the guitar and amp, no change in sound quality and no added noise. In other words, the signal that arrives at the amp is identical to the signal that left the guitar. Sadly, cables always fall short due to capacitance. Capacitors are made from two electrical conductors in close proximity separated by a non-conductive material. As discussed, an instrument cable has a central conductor within a braided wire shield separated by an insulating layer. If you think that sounds a lot like a capacitor, you’re correct. An instrument cable is actually a very long capacitor and it connects between the hot output of your guitar pickup and ground. If you check out any regular guitar schematic, you’ll see that each tone control has a capacitor soldered between the control potentiometer and ground. Rather than boost high frequencies, guitar tone controls are actually low pass filters that allow you to determine how much treble to roll off. Cable capacitance has the same effect, but you can’t control it. Instead, the amount of treble roll off is determined by the capacitance of the cable – and not all cables are created equal. 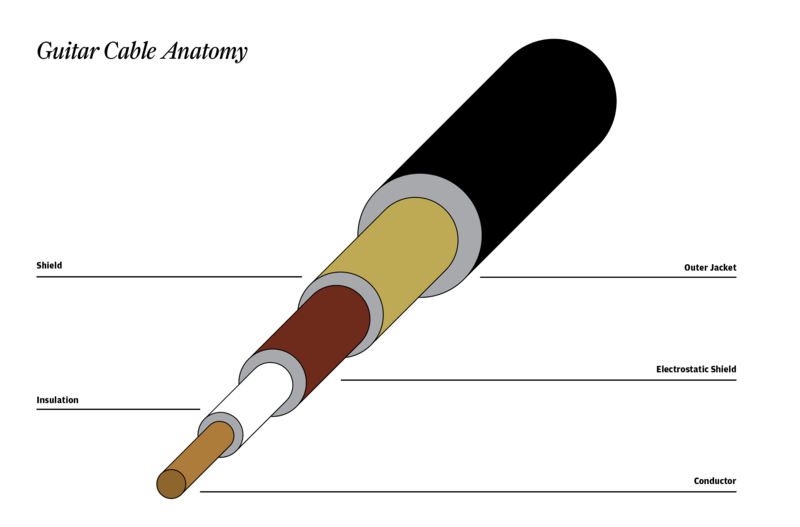 Typical instrument cables measure about 100pF (picofarads) per meter in length. That’s almost the same capacitance value that Fender use for bright switches in amplifiers. If 100pF can make a clearly audible difference to high frequency response, then higher capacitance will have an even greater effect on your tone. A typical guitar cable may be four metres long so its capacitance will be closer to 400pF. As capacitance increases, the roll off frequency is shifted ever lower and the sound gets darker. In essence, instrument cables sound darker the longer they get, however opinions differ on whether that’s actually a bad thing. Earlier we used the term ‘theoretical ideal’ because conventional metrics of quality don’t always apply to guitar tone. Just as low-impedance pickup systems and low-distortion solid-state amplifiers attract very few guitar players, low-capacitance sonically neutral instrument cable can work against you. What sounds ideal in theory often sounds less than ideal in practice. Although treble roll off may seem less than ideal, many guitarists prefer the treble-reducing effect of longer cables. If you’ve ever played a Strat or Tele through a 100-watt Marshall, you can probably figure out why. It’s a matter of taste, but one player’s bright is another harsh. Artists as diverse as Brian Setzer, Keith Urban and Jimi Hendrix have all stated a preference for lengthy guitar cables, but the explanation goes beyond mere treble roll off. Guitar circuits are surprisingly complex because they contain resistors, capacitors and inductors. In combination with cable capacitance, you end up with a wah-style resonance peak at the cutoff frequency and the position of that peak can be character defining. Guitar and pickup designer Bill Lawrence cites a specific example: “Jimi Hendrix used a coiled cord with 3,000pF (of capacitance). This was the secret of Jimi’s tone: shifting the resonance frequency below 2,000Hz on his Strats has a similar effect to a midrange boost.” Lawrence also noted that Hendrix would reach for shorter cables in the studio when he needed a brighter tone. The suitability of an instrument cable should be considered in the context of a complete rig rather than in isolation, and achieving the ‘best’ tone doesn’t necessarily mean buying the ‘best’ cable. And if your quest for vintage tone has led you to buy vintage equipment or the finest contemporary replicas, low-capacitance cable may lead you in entirely the wrong direction. Instrument cable that is considered top quality and priced accordingly doesn’t actually sound ‘good’. Instead it’s more accurate to say it has little or no ‘sound’ at all. If you’re trying to gauge the audio characteristics of guitar cables, the capacitance per meter specs will provide a better indication than the price per meter. Cable manufacturers that do not publish the capacitance figures should probably be regarded with suspicion. Try taking your guitar along to your local music shop to audition prospective cables. If its possible, take your amp with you, too – or at least try to test the cable with an amp similar to your own. Think carefully about the cable length you actually need and if you enjoy going walkabout, consider a curly cable. They tend to be quite capacitive, but that may suit your sonic tastes – and they do look cool! If you tend to change guitars a lot during a gig, consider cables with Neutrik muting jacks for silent unplugging of your guitar. Gold-plated jacks look nice, but they don’t sound superior. The gold is merely tarnish resistant and it will eventually rub off. Despite the shielding, coaxial instrument cable picks up noise and the longer it is the greater the potential for noise pick up. Cables can also make crackling sounds due to static charge build up as the shield rubs against the insulation layer. Genuinely high-quality cables feature an electrostatic shield to discharge static and keep cables crackle free. Try bending the cable you are auditioning and slapping it against the floor to see if it makes noise. If it does, then think twice about buying it, because it will only get worse. Conductor materials can include copper, oxygen free copper, linear crystal copper, silver plated copper and solid silver. The centre conductor wire may also be solid or stranded. There is much debate on the tonal merits of expensive wire, so if you can hear a difference then there is a difference – and if you can’t, there isn’t. If it’s the latter, don’t feel obliged to pay for something you can’t hear!